We combine EMMETT Technique with Bowen Therapy to ease pain & discomfort. To improve physical balance & stability. To make movement more comfortable. To simply relax & release tension. We call our combined bodywork Bow-EMM therapy. It’s gentle and quick, and every sessions is results driven. We are Jill & Paul Dagless, and we use our therapy on each other so know the benefits first hand. See Contact to book your appointment, or find us at an event where you can have a Bow-EMM or EMMETT Technique session with us. 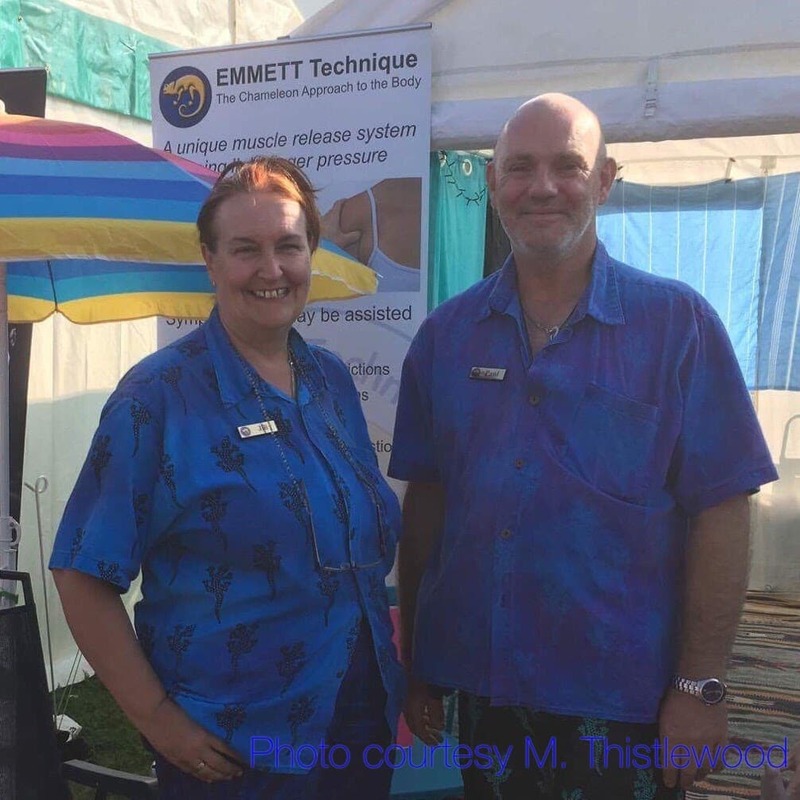 Ross’s time in Mt Isa, serving clients who had come in from the remote Australian outback for relief of pain, encouraged Ross to evolve fast, effective ways of relieving pain that also gave long-term relief - these Ross now teaches as EMMETT Technique - the chameleon approach to the body. Bow-EMM therapy, including EMMETT Technique and Bowen therapy, does not directly treat any condition and is NOT intended to replace or substitute any medical advice or treatment. We recommend you consult your own General Practitioner or health care professional about any health concerns or issues. Bow-EMM is usually applied through light weight clothing or directly on skin, with the client be standing, seated or lying down on a therapy couch. Most sessions are around 20-30 minutes, however sometimes only a few minutes is needed and occasionally over 30 minutes. Bow-EMM is a very portable therapy, because a therapy couch is not essential, and is useful where clients may have mobility issues. Another result of combining techniques seems to be fewer initial sessions for relief, sometimes only one or two, and longer between maintenance sessions, making Bow-EMM your 'goto' affordable therapy. Bow-EMM is for anyone who is experiencing pain & discomfort or restriction of movement. Bow-EMM is so gentle that we can use it on all ages from newborn to the elderly. If you experience pain, whether from sports activities, work (either heavy or repetitive) or health issues, especially if you just put them down to 'aging' or 'old injuries' you may find Bow-EMM beneficial. Using EMMETT Technique is especially beneficial because the results are often improved with movement and work, so you can safely add Bow-EMM into a rigorous training or active work schedule. A whole body Bow-EMM session is usually a very relaxing experience. We also offer EMMETT Technique sequences that may be beneficial for sinus congestion and the lymphatics, which are very quick and also quite relaxing. TBT comprises a series of gentle moves, which encourages your body the opportunity to self correct and relax, whilst allowing us to assess your body for tensions. The use of small time delays allow your brain/body to re-evaluate and may result in release of tension and a state of body relaxation. The EMMETT Technique is based on the belief that light touch can trigger a relaxation response in the soft tissue of the body, and the therapist may help relieve tensions resulting in feelings of improved comfort within the body. It may be enjoyed by people of all ages, from babies to the elderly. Many people find they feel more at ease within their body and emotional well-being is enhanced. EMMETT UK & Ireland Introducing EMMETT Technique from Emmett on Vimeo. We combine Ross Emmett's EMMETT Technique and Tom Bowen Therapy, we call it Bow-EMM Therapy. We individually tailor it to address your unique needs, providing a gentle effective therapy, to ease tension in muscle groups, to ease pain & discomfort. Bowen Therapy is a gentle, non-invasive therapy we usually use to relax the whole body, releasing areas of tension & promoting the bodies natural healing abilities. Bow-Emm Therapies including EMMETT Technique, EMM-Tech and Bowen Therapy are not intended to replace or substitute any medical advice or treatment. It is recommended that you consult your General Practitioner or health care professional about any health concerns.